Taiwan’s key role within the global computing and consumer electronics supply chain has dominated its manufacturing landscape. This expertise, coupled with significant R&D investment, has created a substantial depth of IP assets in the jurisdiction. These have traditionally been used as purely defensive tools; however, as profit margins are squeezed and competition intensifies, Taiwanese companies are embracing more proactive IP management tactics to drive both strategic and real value for their businesses. Against this dynamic background IAM was pleased with the return to Taipei for the second IPBC Taiwan held on April 17 2018. Building on IAM’s extensive relationships with the jurisdiction’s IP community, IPBC Taiwan was specifically designed for senior IP executives at leading Taiwanese corporates, research institutions, government agencies and their international counterparts from across Asia, Europe and North America. 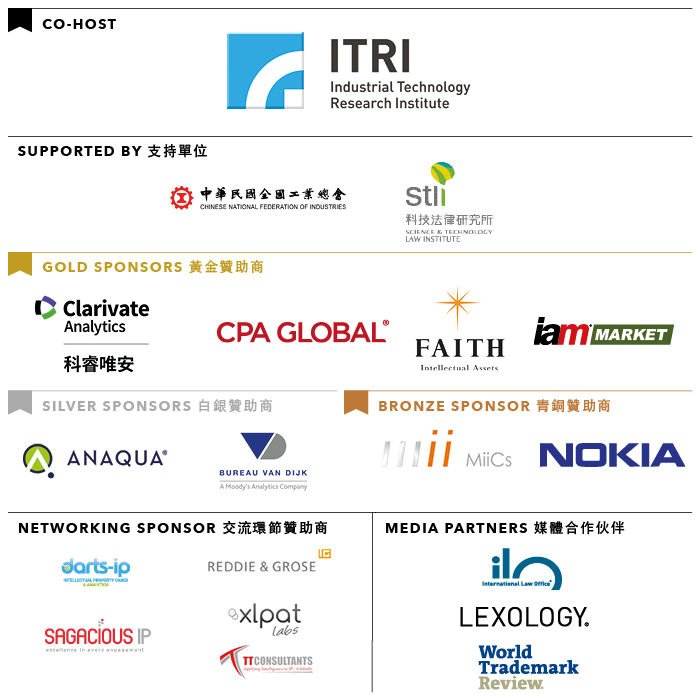 IPBC Taiwan 2016 was a phenomenal success, with over 240 delegates from leading domestic companies, international corporations, research institutions and government bodies in attendance – these groups made up over 70% of total delegates – the 2018 event has built on this unique gathering. The fully bilingual sessions provided attendees with best-practice advice, as well as outlining the international opportunities, challenges and pitfalls that they face. As with all IPBC events, particular focus attached to the networking aspect of the event to allow senior IP managers to come together to discuss key issues and challenges in a relaxed and convivial atmosphere. For more information on IPBC Taiwan 2018, please contact Bing Zhao on +852 9751 2206 or bzhao@GlobeBMG.com. IAM hosted two dedicated events back to back: IPBC Taiwan in Taipei on Tuesday April 17, and IPBC Shenzhen on Friday April 20. This allowed international delegates to structure a single business trip to attend both events, and gain unparalleled access to these key markets, in just one week. Join us across Asia – registration now open! Our focus now turns to a series of local and regional events taking place across Asia in key jurisdictions in 2018. Join us there for more high-level insight, analysis and debate. For more information on IPBCs in Asia, including our multi-event rates and sponsor opportunities, please contact Kint Hui on +852 3956 1600 or khui@GlobeBMG.com.